Percentage of swimming worldwide that involves water — 100%. Percentage of Americans who are afraid of swimming pools — around 50%. Approximate number of drowning deaths that occur each year — 3800. Approximate number of these drowning deaths that occur in pools –700. Approximate number of pool-related emergency department treated injuries that occur each year — 5700. Percentage of Americans who are afraid of deep, open bodies of water, like lakes — around 66%. Percentage of Americans who are afraid of the deep end of a swimming pool — 46%. Percentage of American men who say that they are unable to swim — 21%. Percentage of American women who say that they are unable to swim — 51%. Percentage of Americans who say that they are unable to swim — 37%. Percentage of African Americans who say that they are unable to swim — 62%. Percentage of Caucasian Americans who say that they are unable to swim — 32%. Percentage of Asian Americans who say that they are unable to swim — 47%. Percentage of Hispanic Americans who say that they are unable to swim — 44%. Rank of drowning as cause of unintentional injury and death in children 1 to 19 — 2. Factor by which 5 to 19 year old African American children are more likely to drown in a swimming pool than their peers — 6 times. Percentage reduction in drowning of 1 to 4 year old children which can be attributed to formal swimming lessons –88%. 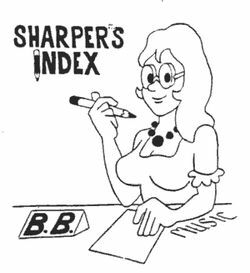 Editor’s Note: B. Bea Sharper, a big swimming pool fan, wasn’t bothered that the numerical facts for this piece came from the National Swimming Pool Foundation, but the whole thing seemed a bit awkward to me. The point being made, if I understood the article, is that you should get yourself a swimming pool so you can learn to swim so you won’t drown in a swimming pool. Or that African Americans especially should get a pool because their children are six times more likely than “their peers” to drown in a pool. Isn’t this a little like saying you should get your child a gun so he will learn how to handle it and will be less likely to kill himself with a gun? And as for the 46% of Americans who are afraid of the deep end of a swimming pool, they need to put in a pool so they can overcome their fear of the deep end of the pool. There’s a lesson here somewhere, but I’m missing it. –Hardly Waite, Pure Water Gazette.